We give to charities, support research, help cancer patients, and strive with blood, sweat, and tears to end this horrible disease. Yet many of us are acquainted with the sad fact that often cancer wins. But the battle continues on many fronts. Today I read an interesting article in the journal 'Science' that might give us another edge. In the article, Stephen W. Morton and colleagues published about a new delivery system for chemotherapeutics (cancer-fighting drugs). Before I discuss what this means, let's take a few sentences to discuss why this technology is important. Cancer cells form and are maintained by disrupting the normal processes (cellular signaling pathways) that occur in a non-cancerous cell. When a cancer patient is treated with a drug or given radiation therapy, many of the cancer cells will die, but often a small percentage of resistant cells linger behind. These are the worst possible cells for a patient. The reason these cells are so pernicious is they have developed a way to resist the current treatment. They will expand clonally, giving their resistant nature to all subsequent cells; thus, the patient will relapse, but this time that first treatment won't work anymore. Very, very bad news. Researchers know this and are searching for ways to make those cells sensitive again by blocking the signals in those cells that make them resistant. In this particular article, the heavily-studied cell receptor, EGFR (epidermal growth factor receptor) is targeted to make the cells sensitive. All that is rather routine. What's not routine about this publication is the new drug delivery technology. This image is taken directly out of the article. It represents the structure of the nanoparticle-based drug delivery system. The little red balls are hydrophilic ("water-loving") ends of lipid molecules. If you're not familiar with those, that's okay. Just keep reading. A sphere produced by lipid molecules is referred to as a liposome. These are formed in your body regularly as part of normal cellular processes. Scientists have copied the idea from the design of life and are attempting to take advantage of it as a way to deliver drug treatments. 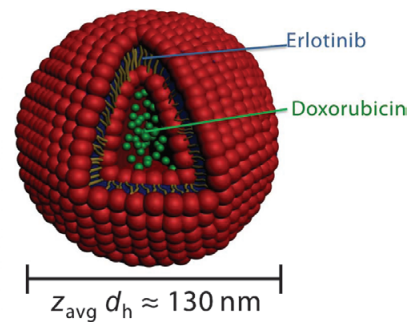 By packaging chemotherapies in these manufactured liposomes, researchers can deliver a "one-two punch" to cancer cells. The first punch (Erlotinib) weakens the cells and makes them sensitive to the second punch. The second punch is a well-established chemotherapeautic (Doxorubicin). The beauty of this system is the time delay between the release of the punches. If the second punch comes too early, the cells won't be weak. If the second punch comes to late, the cells may have recovered from the first punch. The liposomes can be engineered to deliver other chemotherapeutic combinations and release them at different times based on research-based treatment regimens that harness the most "bang for their buck." Even more exciting is that the liposomes can be "tagged" with surface molecules that will bind specifically to surface molecules on the targeted cancer cells. This ability to fine tune the liposome for each type of cancer means the delivery system can specifically target cancer cells to a much higher degree than normal cells. This helps reduce treatment side effects, which are a major clinical problem. While the delivery system is in early stages, it's exciting to see progress. Keep an eye on nanoparticle-based treatments. I have a feeling your or your children may end up benefiting from them.